Set in the aftermath of John Brown's Raid on Harper's Ferry, UPRISING explores self-determination and sacrifice through the lens of a free black community during secession-era America. When Sal discovers Ossie, a hypnotic revolutionary hiding in the field, her life is turned upside down by her strong attraction to him and his revolutionary mission and its impact on her commitment to the well-being of her young son, Freddie. 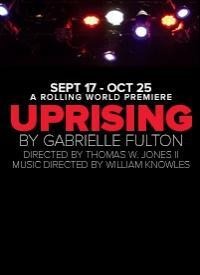 Inspired by the true story of Osborne Perry Anderson, the only African American participant in John Brownâs Raid to survive, and the tales of the playwright's cotton-picking great-grandmother, UPRISING explores notions of freedom and sacrifice, family and community.